Home > Heavy Duty V Belts > V-Belts. A, B, and C Sections. Standard and Kelvar Construction > Classical B Section 21/32 inch (.66") Wide. Classical V-Belts. 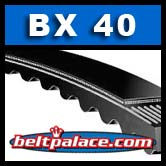 > B40 Classical V-Belt. Industrial Grade > BX40 Belt. Power King Cog (Tri-Power) Molded Notch Industrial V-Belts: BX40 - 43" Length.